As a parent, you’re likely all too familiar with telling your kids about the importance of cleanliness. Don’t touch that. Did you wash your hands? Take off your shoes! Particularly as they learn to crawl and explore, you want to protect your child from whatever may be lurking on the floor, dirt and dander from pets, and (ack!) the perils lurking in the outdoors. And with good reason. Our ideas about dirt and germs stem from a very real history of widespread disease as a result of poor sanitation practices — who doesn’t shudder, for example, at the idea of the Black Plague? But most often, ideally healthy cleanliness isn’t a choice between filthy black contamination and sparkling white sterility — strangely enough, it’s a sort of dingy gray area. Without the presence of germs, the human immune system doesn’t have the opportunity to learn how to fight common invaders it will encounter over and over again. This is particularly important in newer, developing immune systems — those of babies, toddlers and young children. Repeated studies show that some exposure to common pathogens is not only okay, it’s beneficial. 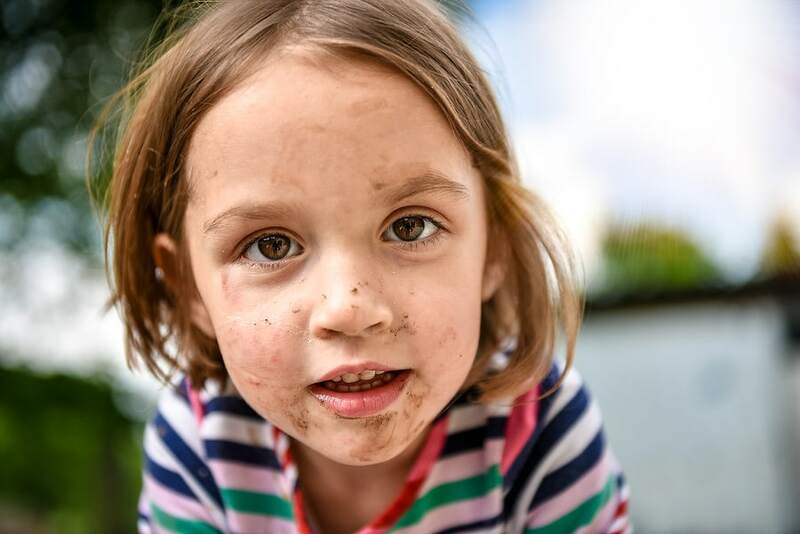 Did your two-year-old pick up a rock in the park and lick it? Did she take a free sample from the dog’s bowl? While you clearly don’t want to encourage this behavior, you don’t necessarily have to panic when it happens. Try putting yourself in the same situation: If you licked a rock/ate from the dog food bowl/etc., would you be worried about becoming seriously ill? If the answer is no, the same most likely applies to your child. Of course, basic logic on the other end of the spectrum always applies — never hesitate to immediately get help if your child has ingested or otherwise been exposed to substances like chemicals or drugs. When it comes to cleaning your house with your kids in mind, though, you don’t have to bleach every surface three times a day. Yes, you should clearly wash used bottles, dishes and utensils, but they don’t always have to go through the dishwasher. Cleaning visible snot from Duplo blocks is good — on the other hand (unless you run a daycare), disinfecting every Duplo block in case someone put it in his mouth isn’t necessary. Hand sanitizers are helpful on road trips if the rest stop is out of soap; you don’t need hand sanitizer for every trip to the playground. Bottom line: Try to be a role model somewhere in between Pig-Pen and Mr. Clean…because not only do your kids depend on you for a healthy living space, they also need your guidance in developing healthy common sense for the rest of their lives. — Submitted by PetalSweet Cleaning, a residential and commercial cleaning company headquartered in Medina.